spp., and others. It gives up to three generations per annum and the butterflies are observed on wing from mid March till early November. The species is slightly uncommon within typical habitat and demonstrates growing population trend in 2003-2013 (p<0.05). It appears that the species' adaptability and the high rate of its host-plants survival allows it to occupy the niches in degraded habitats. The species is not included in the Global and Armenian Red Lists, as well as in CITES and Bern Conventions, and is listed In European Red Book as Least Concern - obviously the same status should be proposed for Armenia. Occupying almost whole country it occurs in all the protected areas, Emerald Sites and Prime Butterfly Areas. 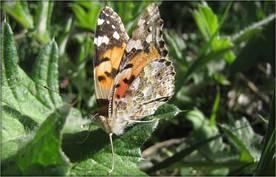 There is no necessity for special conservation measures for the Painted Lady, however its monitoring remains important for better understanding of human influence on the ecosystems.